I’ve always loved taking photos, at University I was always the person who had a camera fixed to their hand and everyone dreaded getting tagged in the photos on Facebook the next morning! That hasn’t really changed at all in recent years and due to blogging and especially since the rise of Instagram, taking photos is pretty much second nature to me. Therefore I’m always on the lookout for an updated camera to increase the quality of my photos and recently have got my eye on this Mirrorless 12-60mm Lens Camera from Panasonic, it’s got up to 30K optical zoom, 4K photo and video all in a sleek compact design. Sound pretty perfect huh? Photos are my favourite kind of memories and there are certain photos, especially from my travels, that I look at and I just get taken straight back to that particular moment and I can’t help but feel so so happy thinking about those memories. I love reading about everyones travel memories and journeys as everyone has such different experiences, it's always so interesting to hear, so for todays post, I'd thought I'd share a couple of my favourite travel photos and memories! The Great Wall of China - China. Travelling to China was an absolute dream! We visited Shanghai, Beijing and Xi'an and it was one of my best ever trips! Climbing the Great Wall of China was such an amazing experience and one that I have managed to tick off my bucket list. My friend Sarah and I climbed for 11km and we treated ourselves to a beer at the top of one of the turrets and took in the view - so incredible! Paris had been at the top of my 'to visit' list for so so long! I kept seeing photos on my instagram feed and I was so unbelievably desperate to go so when we booked our trip I couldn't have been happier! As it was my first time there I wanted to do absolutely everything and that we did! We walked and walked and then walked some more and really made the most of our trip, visiting all the tourist hot spots and I think I walked round with a huge smile plastered on my face the entire time! Paris is just so chic and everywhere I looked, it was just so beautiful and I can't wait to start planning my next trip there! Top of The Rock - New York. New York, New York! I've visited a few times now, most recently last year and I saw the city in a whole new light. I managed to visit a few more places that I hadn't visited before as well as getting all those instagram photos for the gram - obviously super important! One of my favourite spots was Brooklyn which I hadn't visited before, unfortunately we didn't spend as much time there as we hoped to so I'd love to go back but it was lovely to walk around and explore that area! 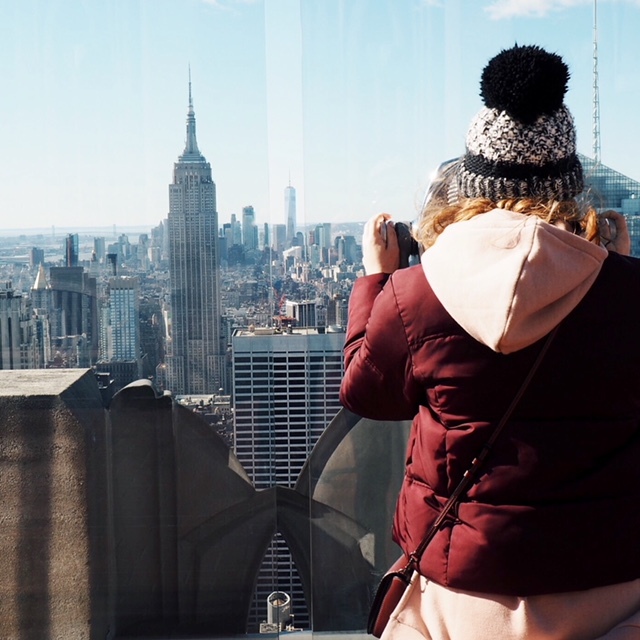 But I think my favourite spot in the city was Top of The Rock. The views from there are absolutely incredible! We bought tickets so we could go up twice in one day so we could experience the views during the day but also at night, which was so incredible! I love nothing more than seeing a city all lit up! Thailand was one of those places that I felt I just needed to visit so last year I finally managed a trip there and it exceeded all my expectations. I visited with Thai Intro and had an absolute blast! I explored the country, went snorkelling, fed elephants, had parties on the beach and I experienced all that with the best group of people! 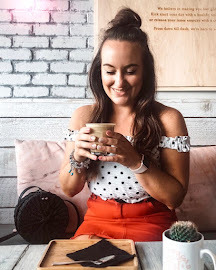 It was the best two weeks and I've stayed in touch with the girls who I travelled with and we have booked our next trip to Bali for later on this year - so excited! What can I say about Santorini? It's a blogger fave and I can completely understand why! Soph and I stayed for a week and completely made the most of our trip - everywhere you looked was so beautiful and instagrammable and I love looking through my photos from that trip. Barcelona was such a pleasant surprise to me! 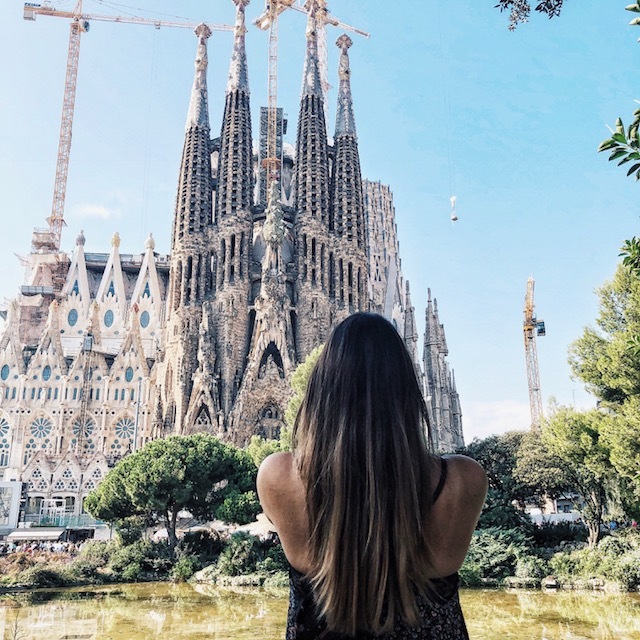 When I go on city breaks, I tend to have an itinerary so I can really make the most of my trip but for Barcelona I had no plan at all and it was so lovely! I did have an idea of what I wanted to see and do but I did everything at such a chilled pace and I think thats why I enjoyed it so much. This photo from Sagrada Familia is one of my favourites from the trip. Now I'm not going to lie, I wanted to re-create a photo that I had seen on instagram but it was so busy around that area so it took a little while to get a clear shot (my mum was very very patient!!) but I got it! I'd recommend Barcelona to anyone looking for a city break as there is something that everyone can enjoy! I'd love to hear about your favourite travel memories? Where is your favourite place that you have visited? This was a collaborative post but all writing/opinions are my own.